By the music they create you'd scarcely believe that this trio of: Stuart Diamond (lyricon), Karen Bentley (violin) and Don Slepian, are American. You see, one is used to a certain feel in synth fronted music from the USA, but Electric Diamond sound so very European. I suppose the reasons for this are the instrumentation and the classical/medieval feel of the music. Very Italian, very Vangelis, very baroque and mysterious. It's unlike anything Don Slepian has done before too, relaxed and restrained without being tedious. The subtleties and richness of the musical textures add to make a music of spontaneous vitality. 'Performed live', with 'no overdubbing or midi-sequencing' it says on the cover - and it's all the better for it. Electric Diamond is a step beyond... A window into the future of music. 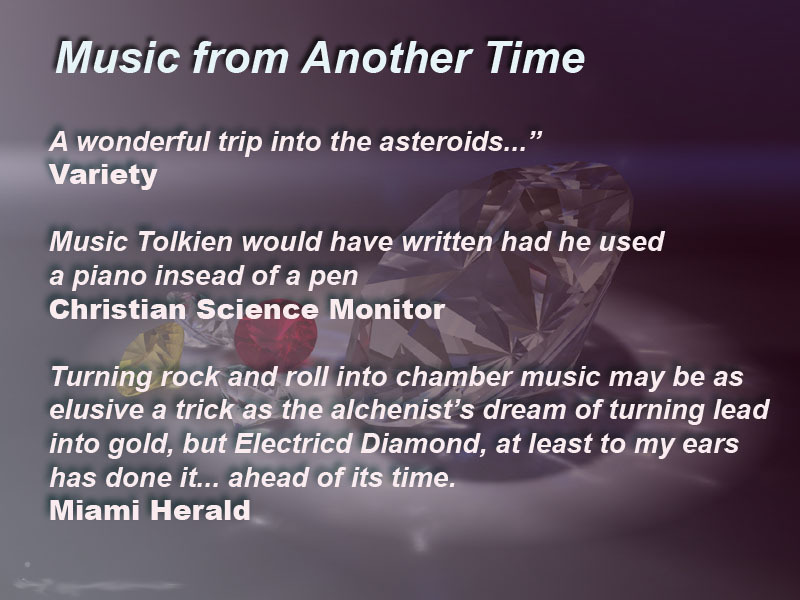 With the release of their first CD, Electric Diamond goes beyond the new age, Ancient airs from the Middle Ages, flute songs of Native Americans and their own original composition are passed through the prism of Electric Diamond to emerge recast for a new millennia. Ambitious words and music. Certainly, this is a pleasant enough album, as performed by Stuart Diamond, lyricon, Karen Bentley, violin, and Don Slepian, keyboard. What, you ask, is a lyricon? The Lyricon is an electronic wind instrument, invented by Bill Bernardi, that transforms the player's breath and embouchure pressures into electrical voltages which in turn control an Oberheim (OB-1) synthesizer. That straight, what's it all sound like? Well, cream-puffy, new/middle-agey, to begin with, in five creative renditions of familiar medieval dances (two French, two Italian, and one designated English), harmonized and rhythmicized (purists beware!). The 14th-century "Ductia" has the lyricon coming off as an Irish Piper, and the 13th-century "Dance Royale" takes a stately rather than a perky approach. "Lamento di Tristano" (14th-century) takes the solemn approach of Florilegium Musicum of Paris rather than the uptempo version of HAM; "La Rotta" finds an electric dungeons-and-dragons (with a hint of "Peter Grimes") rather than the sometimes heard Greek party. While the manuscript for "Trotto" is housed in the British Museum, it is Italian, rather than English, in a realization spirited, if not passionate, wittily employing a pseudo-tango beat. Presumably original compositions range in style from koto-like flourishes, neoclassic virtuosity, and minimalist urgency in keyboard to suggestions of country, blues, and jazz in the expert violining. The music has a breadth and a passion that searches across a wide spectrum, and the lyricon demonstrates an ever-surprising range of techniques and timbres. Three large sections -- "Arcadia," "The Shades of Light," and "Sirens" are concluded with another borrowed music, now from Native American flute songs, in "Painted Clouds," which has haunting suggestions of Mahler's "Symphony No. 1" and Villa Lobos's "Little Train." But like Ives or Stravinsky, the disparate influences here add up to the convincingly melodious whole that is Electric Diamond. Last night's performance by Electric Diamond was definitely electric to say the least. For me here in California the show had an even heavier impact. Electric Diamond's opening was accompanied by a heavy thunderstorm and closed with an international war. As I sat back and listened I was surprised to discover what a Lyricon is, that Don Slepian is 50 and that this trio has performed at the Guggenheim Museum. Electric Diamond started out the evening with an improvisational "jam" playing what seemed to be some ancient Druid or Welsh influenced classical piece that flowed flawlessly. When I learned that the entire selection was played on the flyI was floored. These guys have been playing together for decades, which just goes to demonstrate how three musicians can connect and become one. Stuart Diamond's Lyricon intrigued me as I had never heard of the instrument. It is a wind instrument that transforms human breath into synthesized electronic impulses. The sound was simply unblemished and mixed well with the all electronic synthesizer Don was playing. In the breaks between pieces Don took some time to introduce the other members of the ensemble. These conversational interludes proved to be both entertaining and educational and I learned a lot about Electric Diamond and the music they were playing. Don Slepian played a spirited set of keys, always interesting and certainly right on the note. He also hosted the session in the true attitude we expect from AMC. The audience was appreciative and warm, I got the feeling of walking into "Cheers" from the group:). Perhaps I was most taken by Karen Bentley and her violin. Her adaptation to the changes in the improv selections, her mastery over arpeggiated scales and her sheer control over her instrument all came together and made for the epitome of a disciplined classical musician. All in all, Electric Diamond put on a killer demonstration. Now, I'd be lying if I were to say that this particular style of music was my bag, however, I am a lover of all music and a believer that all great musicians, no matter the genre, are great because they have opened their minds to all possibilities. Electric Diamond invoked some deep emotions for me and my wife. This was by far the best ArtMusic Coffeehouse yet! NEW YORK-Turning rock and roll into chamber music may be about as elusive a trick as the alchemists' dream of turning lead into gold, but Stuart Diamond, at least to my ears, has done it. ALBERT H. COHEN, music historian, critic and manager of the Music Critics Association. Composer says Lyricon will help form pit 'orchestra' of musicals in the future. As the gentleness of a Summer evening unfolded, Don Slepian and his wife Jan Julia opened the doors of their East Stroudsburg, PA home for an eagerly anticipated ArtMusic Coffeehouse Concert on Saturday June 23rd. Although previous concerts created a sense of wonder and awe to those who attended them, this particular evening provided an opportunity for electronic music lovers to experience Keyboardist Don Slepian and his longtime musical companion Stuart Diamond on his Electronic Wind Instrument performing together as Electric Diamond. They were joined by Violinist Karen Bentley Pollick whose considerable talents proved to be an extra treat rivaling the cookies and cakes placed upon the snack table. As friends who have attended previous concerts at the Slepian home became acquainted with new comers found their places together to enjoy the performance, the carousel horses that adorn their residence could be seen partaking of the excitement as they poised their ears in anticipation. It wasn’t long until Don welcomed the audience in his living room as well as those who were experiencing the concert through their Live Video Webcast. It was only a span of a few moments until Don took his place before his keyboards and began his customary musical introduction to the concert. This was seamlessly followed by the appearance of Stuart Diamond on stage as he joined Don in one musical rendering after another. Their performance showcased the best of what many have come to appreciate about the texture and qualities inherent in Electronic Diamond bringing back memories to some and new internal avenues to explore in others. Yet, when Karen Bentley Pollick joined the duo, the songs sung by her violin made the impossibility the performance could be transcended a self evident reality. The combination of the musicians’ insights and love for the music shined throughout the performance illuminating their audience into a thoughtful contemplative reflection. There was a peace felt among those who listened as they closed their eyes so their hearts and souls could be fully opened. One came to understand why many of the names mankind have given their particular deities have the “Ah” sound in them for it was a sound heard often during the concert. Electric Diamond is an electronic classical music ensemble who first performed in 1976 at Carnegie Recital Hall as well as the Guggenheim Museum, and other venues throughout New York City. Don Slepian joined the group’s founder Stuart Diamond and soon began to present programs integrating classical music with free-flowing improvisations. On many occasions, other artists join the duo integrating their skills and insights to the performances. You’ll be able to learn more about Electric Diamond by Exploring their Website at www.electricdiamond.com for more information. The ArtMusic Coffeehouse is held in the home of Don Slepian and Jan Julia who reside in the borough of East Stroudsburg, PA as part of the Concerts In Your Home Series. A variety of musical forms are presented including folk, jazz, classical, and electronic music. The ArtMusic Coffeehouse now offers those who have access to the internet an opportunity to experience their concerts online and participate in their chat room.